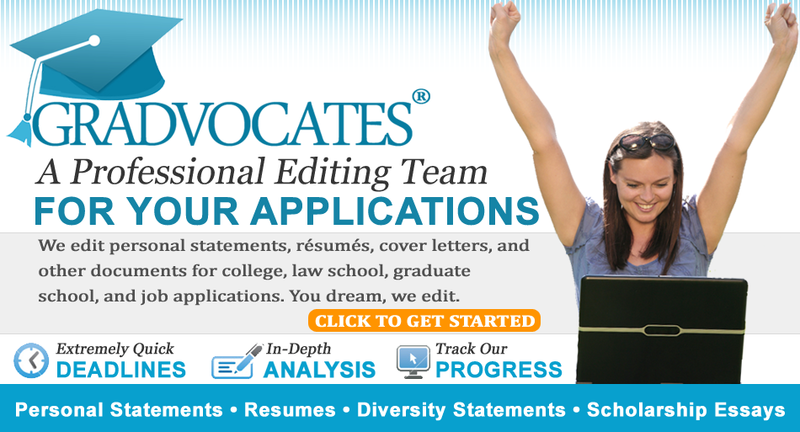 Gradvocates Editing helped me improve my law school essay dramatically while keeping my own voice heard. The editors are patient, answered my questions fast, and returned drafts on time. I am going to a top 14 law school, which was far beyond my LSAT reach! Thanks for your service! Gradvocates did a fantastic job editing my law school personal statement and I would highly recommend their services. Gradvocates significantly improved the structure, voice, and grammar of my essay, making my law school applications much more competitive. Working with Gradvocates was a great decision! They were easy to work with, stuck with deadlines, and came through when they edited several essays for my law school application. Their edits were clear and spot on, and I wouldn’t hesitate to recommend their services to anyone. I was admitted into and currently attend one of my top choices, and I’m sure I owe Gradvocates a ton for all of their help. I admire the incredible work you've done in helping me, and I sincerely mean what I say. Please be sure of my gratitude and my extreme satisfaction with the services you've provided.